The IEEE European Test Symposium (ETS) is Europe's premier forum dedicated to presenting and discussing scientific results, industrial application results, emerging ideas, applications, hot topics, and new trends in the area of electronic-based circuits and system testing and reliability. ETS is organized annually in a different European country. In 2018, ETS will be held in Bremen, Germany, and will take place during May 28- June 1. ETS is the nucleus of the European Test Week which includes TSS (Test Spring School), fringe workshops, and fringe meetings. ETS offers commercial vendors the opportunity to give technical presentations in Vendor Sessions in a track parallel to the regular paper sessions. Typical content includes product descriptions, case studies, best practices, and user testimonials of products or solutions. ETS also offers the opportunity for Table-Top Demos during the event. Table-Top Demo participants get a table, poster board, and electricity outlet provided by ETS. A Table-Top Demo may include displaying slides and/or demoing tools or products. Proposals for the Vendor Sessions should be technical or application focused, rather than overly sales-and-marketing focused. 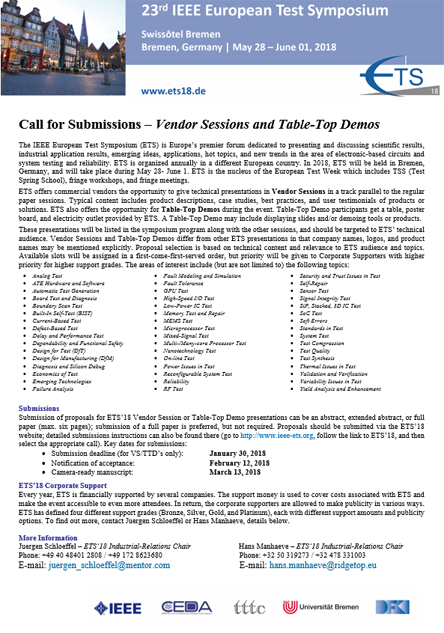 A submission to the ETS'18 Vendor Sessions can be an abstract, extended abstract or full paper (max. six pages); submission of a full paper is preferred, but not required. Proposal selection is based on the technical content and relevance to ETS'18 audience and topics. Priority will be given to Corporate Supporters with higher priority for higher support grades. By means of submission, vendor session presenters agree to register for and participate in ETS'18, in case the submission is accepted. All material that vendor session authors are willing to provide, such as abstracts, papers, slides, posters, etc, will be included in the ETS'18 Informal Digest of Papers, which will be made available to all participants. Every year, ETS is financially supported by several companies. The support money is used to cover costs associated with ETS and make the event accessible to even more attendees. In return, the corporate supporters are allowed to make publicity in various ways. ETS has defined four different support grades (Bronze, Silver, Gold, and Platinum), each with different support amounts and publicity options. To find out more, contact Juergen Schloeffel or Hans Manhaeve, details below.